Contributed by Ruth Esteves at Sirona Springs Handmade Soap . 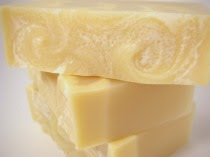 Soapmakers often get asked about the use of lye in their soap. The fact is that lye (sodium hydroxide) is indeed used to make soap. While in many minds, “lye soap” brings up images of grandmas and washboards and red, red hands, anyone who has used handmade soap knows that it is quite mild and moisturizing. Sound like a contradiction? Well, the truth is that the lye was there, but now it’s gone. Is it magic? Sort of. It’s chemistry! Soap, by definition, is the result of a chemical reaction between some kind of oil (like olive oil, coconut oil or cocoa butter) and lye. Lye is a solution made with either sodium hydroxide (to make bar soap) or potassium hydroxide (to make liquid soap). The reaction is called saponification. That’s it. Beautiful in its simplicity, no? The other stuff (colors, fragrance, flower petals) adds to the enjoyment of your shower or bath, but is really unnecessary if you just want something that will clean. Lye can be added by the soapmaker, like I do when making our cold process soap, or it could have been added in a manufacturing facility. In fact, some soapmakers use a soap base that can be melted and then colored and scented. In that case, the soapmaker doesn’t have to handle the lye, but it was still part of the process in becoming soap at the factory before the soapmaker got it. No lye? No soap. Period. “But hold on,” you might say, “the soap I buy at the store doesn’t have lye.” It may seem that way, depending on how the soap is labeled. Some ingredient labels list things like “sodium palmate”. This is the chemical name for the result of mixing palm oil and sodium hydroxide – oil and lye again! That bar of soap was made by blending in some already-made palm oil soap. The lye that went into making the sodium palmate was used up by the time it went into the soap, so it doesn’t have to be listed on the ingredient label. Or maybe the label lists “saponified olive oil”. Now that you know what saponification means, you can understand that saponified oils are oils that have been reacted with lye at some point, even if the label doesn’t actually say “sodium hydroxide”. Another very common reason that a soap label may not list sodium hydroxide is that it’s not soap. Surprised? Many bars in the market today are really solid detergents. Read the labels carefully and you’ll see that they are called “body bars” or “beauty bars” since they can’t call themselves “soap” because they aren’t made with oils and lye. How can lye soap feel so good on the skin? If lye is used to make soap, why is handmade soap so gentle? The trick is that the lye gets used up during saponification. That’s right. The chemical reaction transforms the oil and lye into (Ta-da!) soap and glycerin. The soap cleans your skin (but not so much that all the oils are stripped off ) and the glycerin is a humectant. That means that it attracts moisture from the air and onto your skin, helping it stay moisturized and supple. And unlike Grandma, modern handmade soapmakers are able to formulate their soap using high-quality, beneficial oils and just enough lye to get a mild, conditioning bar that still gives a lovely lather. So have no fear! Use handmade soap and enjoy all the benefits that it brings. Because the magic of chemistry has turned those oils and lye into something completely different and lovely: some of the best soap you can use on your skin!